The extraterrestrial menaces of Starfinder Alien Archive come alive on your tabletop with this box-busting collection of more than 300 creature pawns for use with the Starfinder Roleplaying Game or any tabletop science fantasy RPG! Printed on sturdy cardstock, each pawn features a beautiful, full-colour image of an alien from the Starfinder RPG's first collection of interplanetary threats and unique player-character races. These cardboard pawns slot into size-appropriate plastic bases, making it easy to mix them with traditional metal or plastic miniatures. 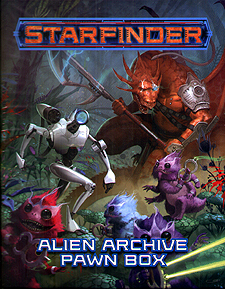 With multiple pawns for commonly encountered creatures and a handful of new foes to fight in starship combat, the Starfinder Alien Archive Pawn Box is the best way to ensure you've got the perfect characters to bring your Starfinder campaign to life!